It’s surprisingly easy to find wow moments in your own garden, regardless how little or much effort you put into creating combinations, because the luck factor graces beginners and experts alike. When you’re not comparing your gardens to other people’s pretty pictures, you can be more open to the moments that come along without any intention on your part. The key here isn’t doing, it’s seeing. The more time you’re out in your garden, the greater your chances of spotting magic moments, such as the way the sun shining through a dark leaf makes it glow the same shade of red as a nearby bloom. Spending lots of time in your garden, with a camera within easy reach, lets you catch great light effects for pretty pictures. 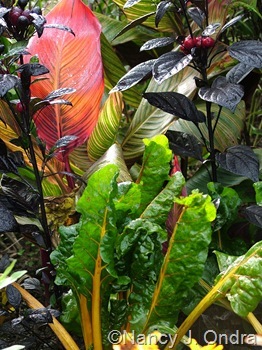 Above are Tropicanna canna (Canna ‘Phaison’), ‘Black Pearl’ pepper (Capsicum annuum), and ‘Orange Fantasia’ Swiss chard; the thin leaves of cannas and chards are especially lovely with light shining through them. 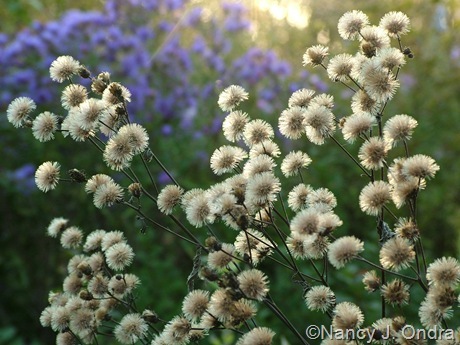 Fluffy seedheads, too, such as those of ironweed (Vernonia), below, have a wonderful way of glowing when backlit by the rising or setting sun. If you want to have a go at making more wow moments happen, then it’s time to get your hands dirty. It’s not about communing with Google to track down the most intriguing rarities or reading art books to study the finer details of color theory; it’s about plain good gardening. First and foremost, the plants need to be compatible from a practical standpoint. 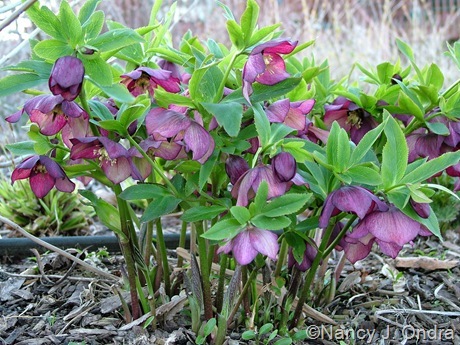 Niceties such as color harmonies and textural contrasts don’t matter if you pair plants that simply aren’t happy to be growing in the spot you chose for them. 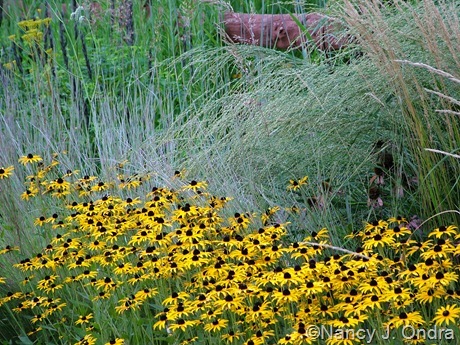 Orange coneflowers (Rudbeckia fulgida var. 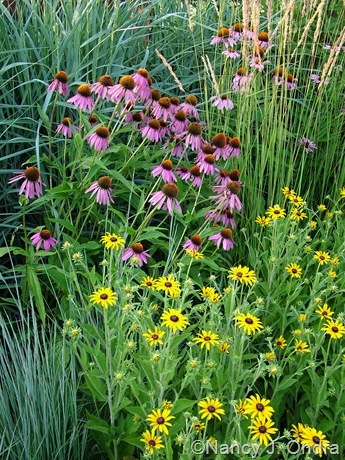 fulgida) and purple coneflowers (Echinacea purpurea – the species, not the fancy hybrids) are utterly ordinary as perennials go, but they’re also dependable and can adapt to a range of soil conditions. 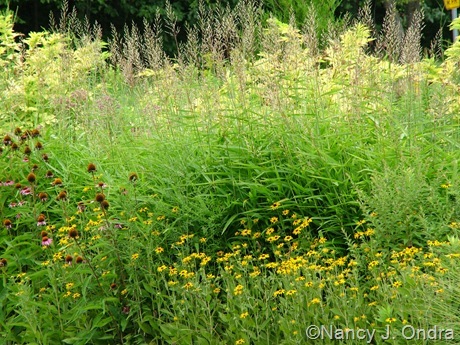 Together, in single clumps or in larger drifts, they make a long-lasting show of summer-to-fall bloom and fall-into-winter seedheads. 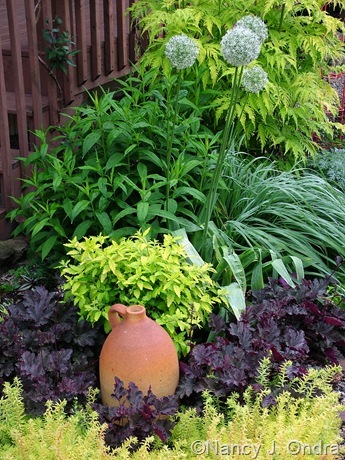 Healthy, vigorous plants that thrive in the same growing conditions naturally look good together. 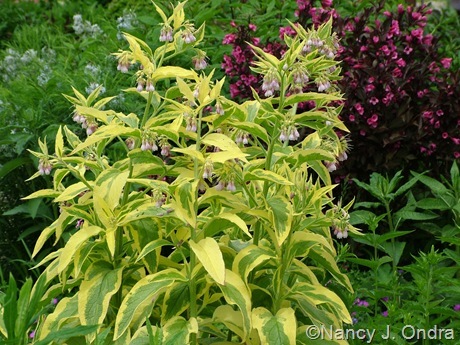 Besides providing plenty of opportunities for pleasing combinations, a backbone of these dependable performers makes the garden as a whole look good, too. 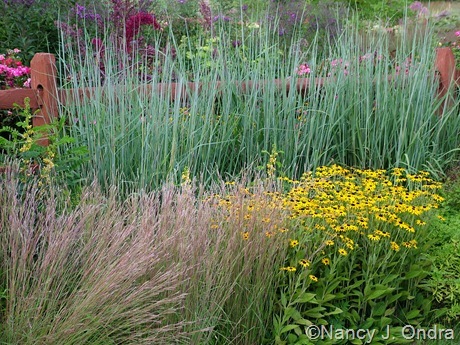 … and ‘Karley Rose’ Oriental fountain grass (Pennisetum orientale), plus cool-season ‘Karl Foerster’ feather reed grass (Calamagrostis x acutiflora) and a bit of prairie dropseed (Sporobolus heterolepis). Once you figure out which plants grow well for you, you can think about shuffling them around to experiment with different pairings. 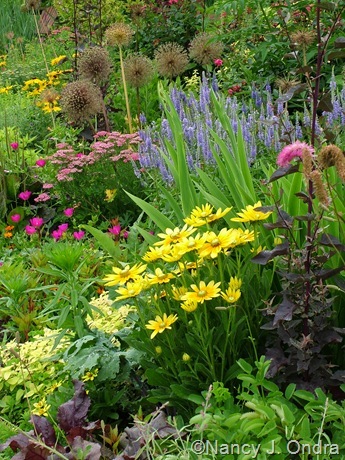 At first, the prospect of moving plants can be daunting, but once you get the hang of it, it can be hard to stop yourself from rearranging whole sections of your garden every year. Eventually the thrill will (probably) wear off, but for a while, your previously lush garden may look a little rough again for a while. No matter: You’re learning one of the most important skills involved in creating pretty pictures. Another “secret” to making pleasing pairings is recognizing that plants can have distinctly different growth habits. That may sound obvious, even to a beginner. 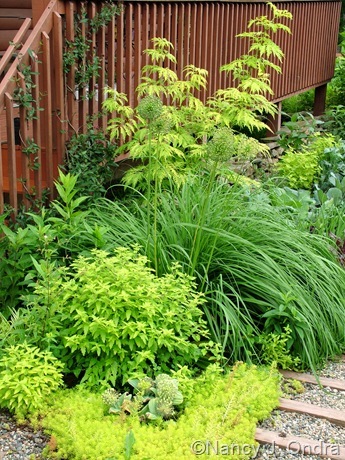 What’s not obvious, perhaps, are the ways you can use that knowledge to your advantage and pack a surprising number of plants into even a small space without crowding them. 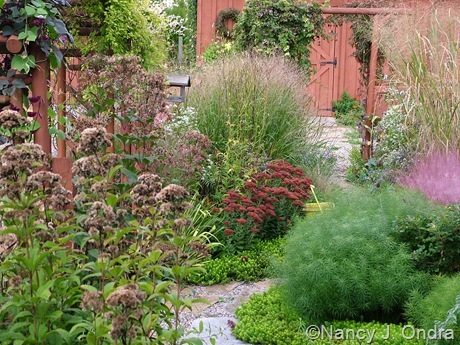 Recently, a reader asked about a particular combination I’d showed and commented “I’m a little (a lot) confused as to how I create something so full when so much space needs to be given for each plant?” That’s a question I struggled with for many years in my own gardens. 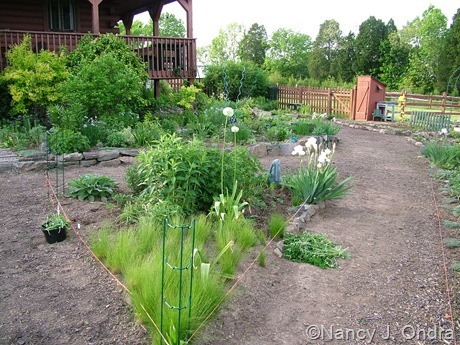 My very first perennial garden, a large island bed at my parents’ house, started as a carefully thought-out plan mapped out on graph paper, with each plant allotted the amount of space recommended by the book I was using. The colored circles looked great on the paper, but the reality was a different story: more like a big expanse of mulch dotted with ridiculously tiny plants. What a disappointment. Eventually, I had to accept that it was possible for books to be wrong. Well, not so much wrong, perhaps; it’s just that a writer can’t possibly know how well you’ve prepared the soil, what size plants you’re starting with, what time of year you’re planting them, how carefully you’re going to tend them, or how the weather is going to affect them. The best any writer can do is give you an idea of how tall and wide each plant usually gets after a few years in “normal” growing conditions (whatever they are). I have to find it amusing when people get uptight about references that give ranges for plant sizes, rather than one specific number for all sites and seasons (3 feet shall be the number thou shalt count, and the number of the counting shall be 3 feet; no more, no less). It’s just not that simple. Sooner or later, you have to accept that there’s a lot of wiggle room when it comes to spacing plants. 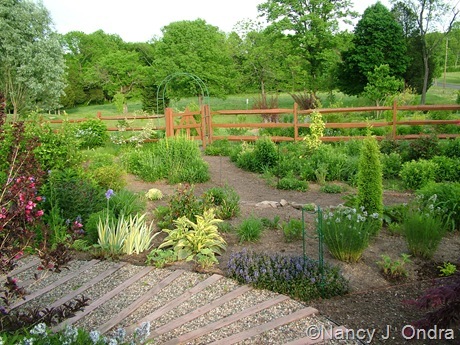 While measurements may have absolute meanings in the real world, they can be many different things in a garden. You learn that for some plants, “2 to 3 feet wide” means that you literally need to allow them that much room because they’re mounded and leafy close to the soil level (or, because they tend to grow up and then sprawl outward). 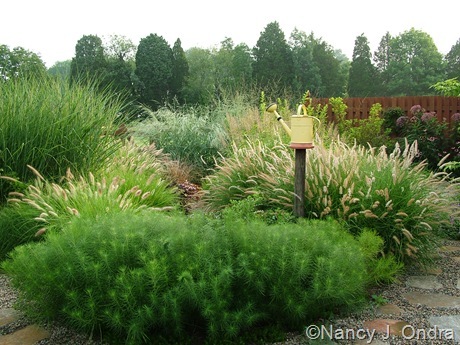 Bushy, upright selections of switch grass (Panicum virgatum), such as ‘Shenandoah’ (above), ‘Heavy Metal’, and ‘Rotstrahlbusch’, really do tend to fill a space 2 to 3 feet across. 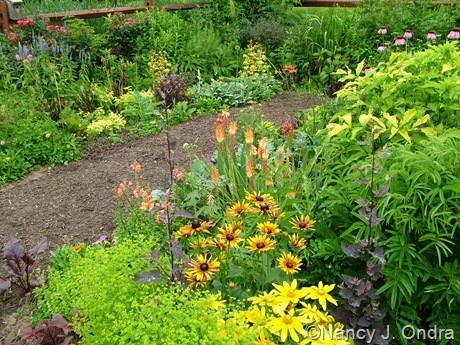 Other plants may branch out to be 2 to 3 feet across at the top but be narrower at the base, leaving room for you to tuck lower-growing plants around them. 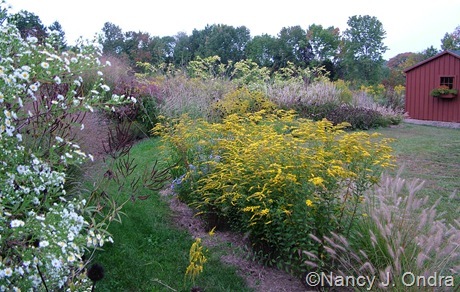 ‘Fireworks’ goldenrod (Solidago rugosa) branches out to be much wider at the top than at the bottom. That leaves space to add bushier plants around it if you want to create more intricate combinations. Some plants can measure 2 to 3 feet from stem tip to stem tip but not form a solid clump: instead, they send out long, almost runner-like stems that wind around and up through their bedmates. Weavers, such as winecups (Callirhoe involucrata) [above], are easy to tuck into already-full borders, because they readily mingle with mounding and upright companions. Some geraniums, including Rozanne (‘Gerwat’), can be mounded if they have space but weavers if they’re tightly planted. 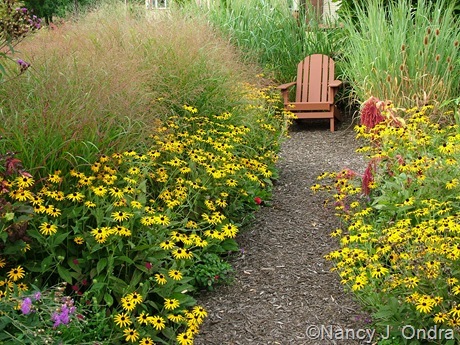 Some plants fill a space 2 to 3 feet across in spring and then go dormant, leaving an empty space that you can fill with other plants for later color. 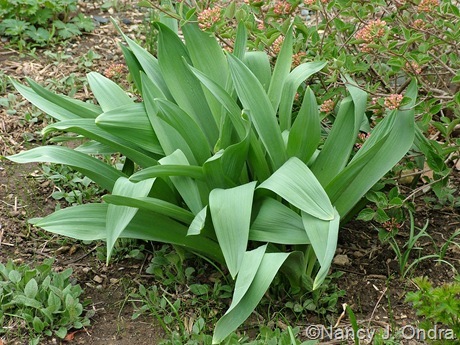 Or, they may be slow starters, such as hostas and warm-season grasses, filling that amount of room but not until mid- or late summer, giving you opportunities to plant bulbs or spring-blooming perennials around them to take advantage of the empty space earlier in the season. Large-flowered alliums, such as ‘Mount Everest’, tend to produce wide, strappy leaves that fill a lot of space in spring but then die back to leave a big hole by midsummer. 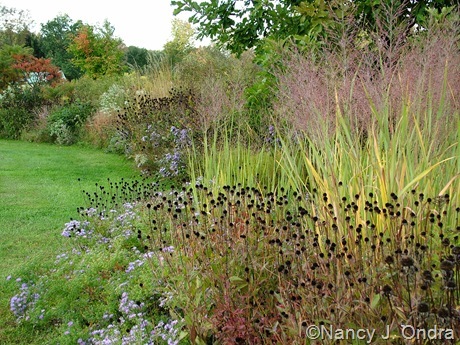 Purple moor grass (Molinia caerulea) and blue mist shrubs (Caryopteris) are two great partners for it, because they gradually fill the space as the allium leaves go dormant, and they support the allium’s flower stems too. The game, then, becomes figuring out how to give each plant enough space to grow freely but not so much that it’s off by itself surrounded by a ring of bare soil or mulch. 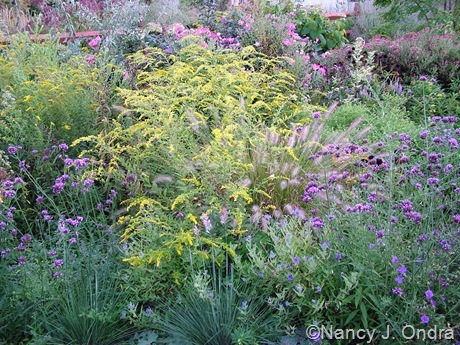 To create the mingling-but-not-crowded effect, you have to think through everything you know about the plants you want to combine, make allowances for the different sizes you’re starting with, put them all together, watch what happens, and then figure out what you need to add, move, or remove to make it work better next year. It would be so much easier if we could come up with some sort of computer simulation to test combinations before we actually plant them, but until that happens, it’s a very slow process of observation, tweaking, more observation, more tweaking, and so on. At first glance, this may look like one planting, but the irises in the foreground are about 12 feet away from the Arkansas bluestar (Amsonia hubrichtii) on the left, and the arches and the alliums in back are a good 30 to 40 feet away. Creating pictures like this is all a matter of perspective. 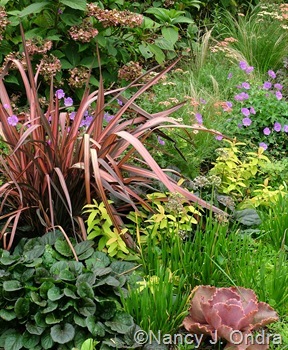 There’s another way to achieve a dense, layered look: the way you set up your beds and borders. I remember a time, back in the ’90s, when some designers were telling gardeners that we needed to make our borders much deeper – that 8 feet was a bare minimum, and 10, 12, 14 feet or even more was really the way to go. Fine advice if you’re installing a 200-foot-long border where space and money are no object, but hardly practical for most home landscapes. 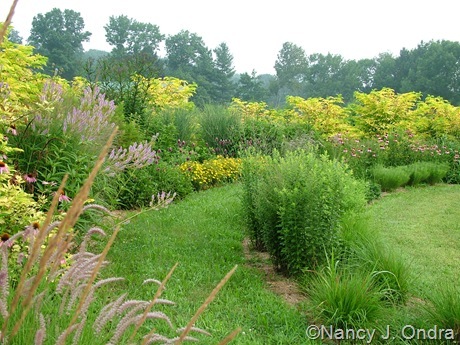 If you’re a regular reader here, you might get the impression that I’ve tried my hand at creating mega-borders, but very few of my plantings are more than 6 feet deep. The impression of depth comes from the layout: squares and rectangles with parallel, perpendicular, or diagonal paths, or curved borders with arcing paths in between. 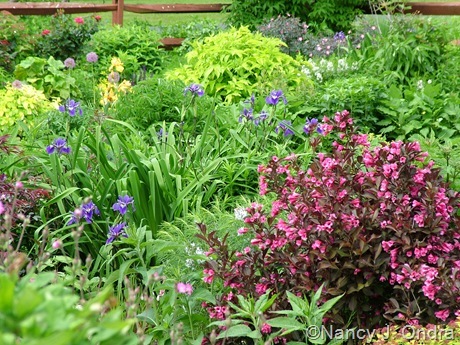 In the spring, it’s easy to see that I have as many paths as I do beds and borders. Later in the season, if I shoot straight on, it looks like I have many sets of double borders. But when I shoot at an angle, the paths disappear, giving the impression of very deep borders. The above images show what I call the Arc Borders, the first from a straight-on view (the way I see them from the house) and the second from one end of the grass maintenance path between them. Below, a shot across much of the front garden, with two paths and a post-and-rail fence hidden by plants from this angle. The squares and rectangles between the foundation border and the borders along the fence are essentially island beds, so I plant them to be seen from all sides. That also gives me a lot more photo opportunities, as I can shoot each plant from many horizontal angles, giving it many different companions without any extra effort and finding all kinds of color echoes that I never expected. Four views of ‘Axminster Gold’ comfrey (Symphytum x uplandicum) taken just a few minutes apart: a single clump shot from four different angles. 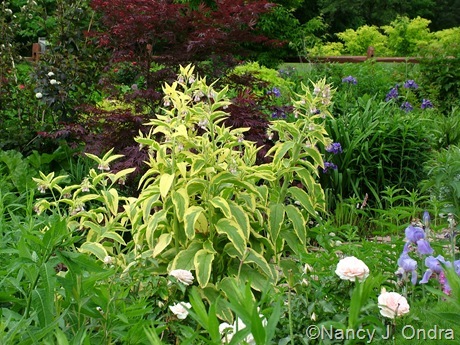 Even a regular border can look much deeper and more densely planted if you stand close to the edge and shoot along it, rather than from a “normal” angle. Zooming in to tighten up the focus helps too. Above and below is the same set of borders from opposite ends, each from a boring “normal” view and from a zoomed-in end view. Yet another way to change the look is to change the vertical angle: instead of shooting down from a standing position, you could bend or kneel to shoot straight across, or get down on the ground and shoot upward. (Forget about your dignity when trying to shoot pretty pictures; it’s all about the art.) Shooting down from the top of a ladder, from a raised deck or porch, from a second-story window, or even from a low roof, is another option. 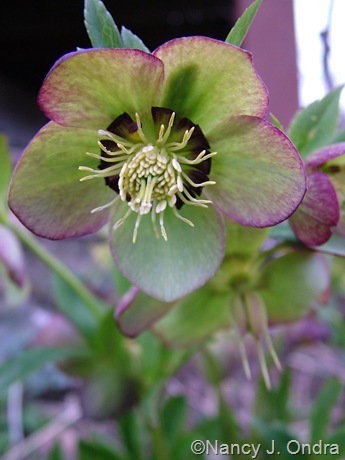 If you shoot Lenten roses (Helleborus x hybridus) when looking down or even straight on, you get a good view of the habit but mostly just the backs or outsides of the flowers. To see their pretty faces, you need to be on the ground, shooting upward. 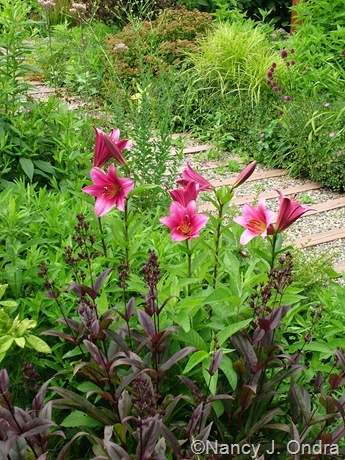 Shot from a standing position, these first-year ‘Purple Prince’ Orienpet lilies are lovely, but the path is a bit distracting. Getting down to a kneeling position and shooting across them gets rid of the path and gives them a nicer background too. Crouching down a bit turned the “bleh” view above into a much more pleasing image. When you shoot straight on, you mostly see the plants; from a slightly raised view, paths become more visible. An extremely high view gives you an unusual perspective on the design of an area that you normally see from ground level, but it can also be unpleasantly “vertiginous” – that is to say, dizzying. Shooting from an extreme angle can be interesting for closeups (when shooting up) or overviews (when shooting down), but to my eye, shooting across – at a level 3 to 5 feet above the ground – tends to produce the prettiest pictures of combinations. 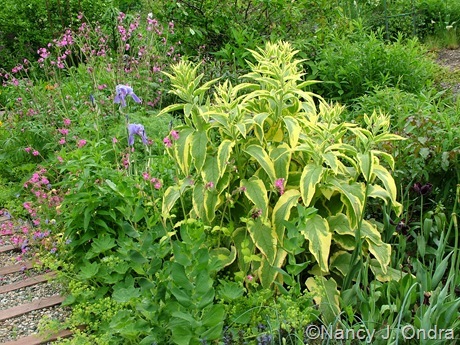 It’s not an angle that most people see the plants from, which is one reason that copying a pretty picture plant-for-plant may not create the same effect in your own garden. But it is a good argument for adding lots of benches, so you can enjoy your combinations for a pleasing angle. Whew. If you made it this far, thanks for reading. I think that’s all I have to say about pretty pictures – for a good while, at least. This has got to be, by far, my most favorite post of yours. Thank you so much for sharing all of this information. 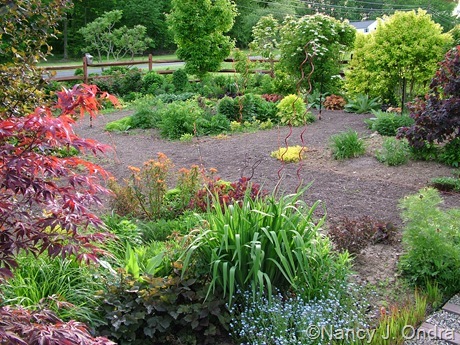 You have a magical way of relating to so many gardeners, new and experienced. I absolutely love that you provide so many visual examples throughout your blog, it truly makes reading it so enjoyable (and user friendly). 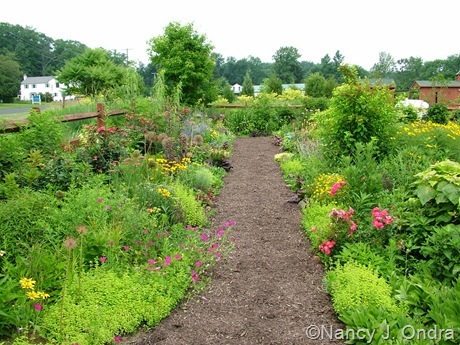 I have to ask, what did you use to make the railroad-looking pathway (the pathway in the picture just above the text, “In the spring, it’s easy to see that I have as many paths as I do beds and borders.”)? It is stunning and a perfect match for your gardens. Thank you once again! Thank *you* for inspiring this post (well, both posts!) with your questions, Teshia. That path is made from 4 x 4’s with gravel in between, with black plastic edging running along the sides and stapled to the wood to keep the gravel from spilling out. I was inspired by a photo I saw somewhere, Mom figured out how to do it, and the two of us built it. It’s held up very well for nearly a decade so far. 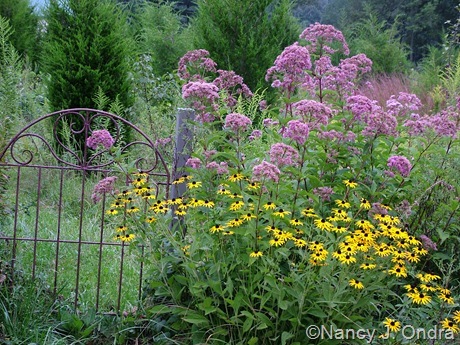 Your garden and your photography and nothing short of exquisite, Nancy! Kudos! Very kind of you to say that, Ilene. I hope all is going well for you this summer. Nancy, your blog is a true gem. I look forward to each post and I am never disappointed. Your photos are gorgeous and the tips and other information you share with us are pertinent, inspiring, incredibly generous and fun to read. Thank you! P.S. I have ordered a couple of your books and I can’t wait to dig in. By the time I finish one of these super-long posts, I wonder if anyone will even bother to read it. Comments like yours make the effort worthwhile. Thank you for that, Hilary, and for buying the books, too. Enjoy! I quote Teshia, this is one of the best post you wrote. 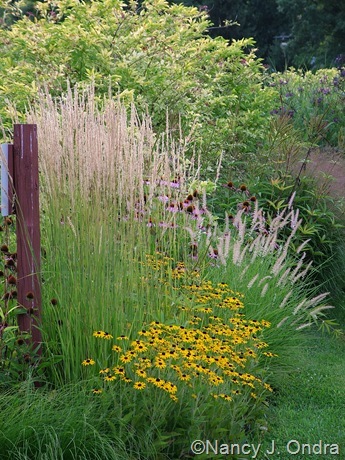 I do too love the layered borders, I tried to use it in my garden too, and it works pretty fine, not only for pictures but for visitors as well, because they discover new paths as long as they walk, and they always have new perspectives and stimulations. Interesting that you mention about visitors, Alberto. I’d say that the one drawback of my place having so many paths is that is seems to confuse most visitors, so they end up not seeing many areas. 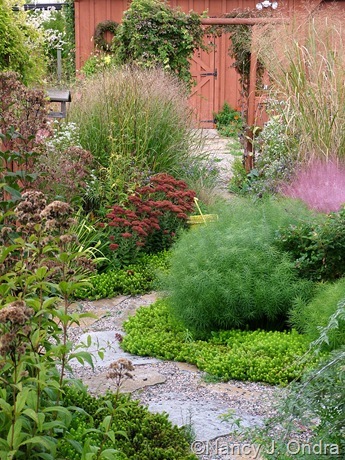 Or, people stick to the first main path and miss large parts of the garden. I’ve watched visitors on open days walk along only the timber-and-gravel path that runs right around the house and be ready to leave for the next garden in 5 or 10 minutes. But every once in a while, there are some true plant geeks, and they manage to spend hours checking out every path and corner. They’re the ones who make all the work worthwhile. 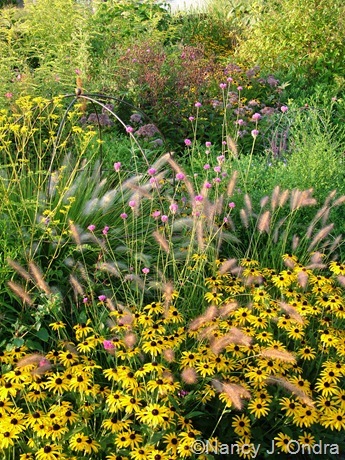 Love all your photos, love the combinations and casual mingling of grasses with perennials. 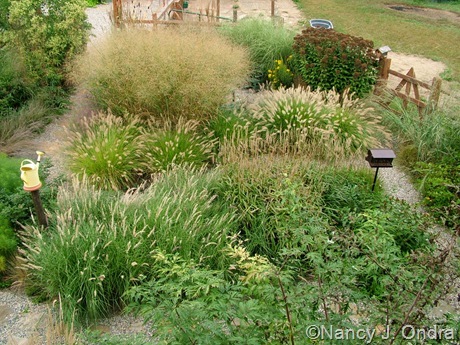 Do you find your grasses trying to take over the garden beds? Do you have to shovel prune? I’m guessing you mean the ornamental grasses, Brenda, and not the grass in the grass paths, which is indeed a continuing hassle to keep out of the beds. None of the ornamental grasses have been a problem; in fact, I appreciate them increasing in width, so there’s less space for weeds to get in. So much great information for the beginning gardener and affirmation for the constant gardener. How I would love to stroll through the paths at Hayfield looking for those golden photographic moments. Ah, but this way, you get the condensed version, from all the best angles and in the best light at the right season. Thinking back to Alberto’s comment, I’ve seen visitors walk right past combinations that have gotten loads of positive comments on the blog! As usual, your use of texture and things I would never even think to put together is stellar. 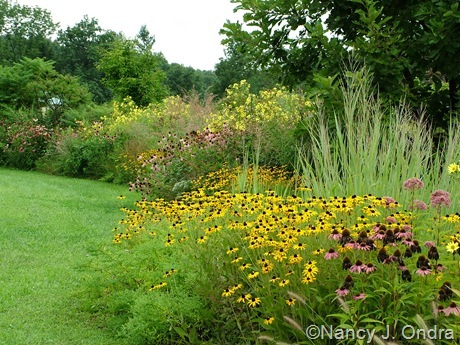 What I constantly marvel at is that so much of it looks totally unplanned — when I look at your borders, I see a meadow of naturally growing wildflowers pushing into your lawn. (Of course, those are the beds that probably took the most planning and work!) You make “natural” look effortless, a guaranteed sign of talent and hard work! 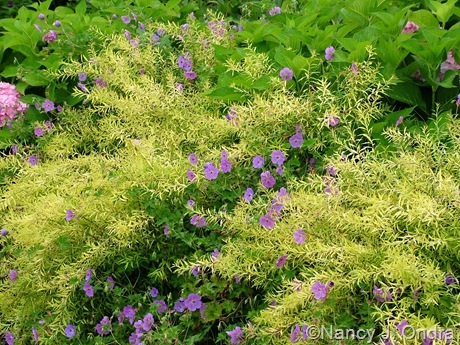 But it’sthe variety of color and texture in the foliage that intrigues me the most. I’m seeing beauty in plants beyond their blossoms and I’ve started thinking about that (rather than bloom time and color) more and more when we make plant selections. Your influence for sure! Thank you, Cathy. And yeah, there was a time that I would absolutely cringe at an rudbeckia: that brassy yellow color and ultra-ordinary daisy shape. But when I had a lot of space to fill, they came to my rescue, and now I’m very happy to have them. Brilliant post! And it’s not about taking pictures, is it? I’m trying to start a garden consulting business, and I could see this being something to show clients–how small beds can trick the eye into a fuller garden. But what you say about planting like plants together is so simple and elegant and true, and no one seems to do it. They fuss and fuss trying to put a round peg in a square hole. 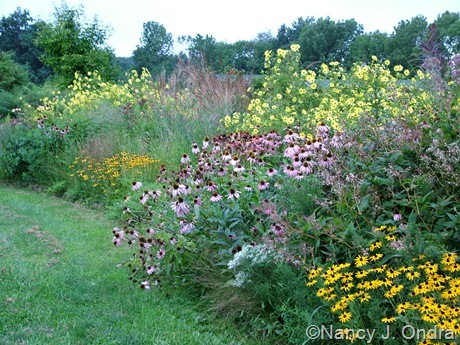 That’s why, for me, thinking prairie plants leads so much fullness and relative plant dependability–they are adapted to the soil and each other and the climate, and it’s not that hard to create pleasing beds as a result (even though folks on my recent garden tour thought I was insane for saying that). Absolutely, Benjamin: the whole idea of studying natural plant communities to get combination ideas would make a great post for someone to tackle. 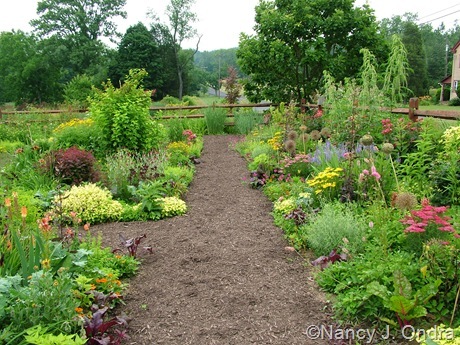 And yes, the idea of using narrow parallel borders with mulched paths in between works great in a home garden setting: you can make very full-looking plantings with fewer plants, and the paths make maintenance *much* easier. 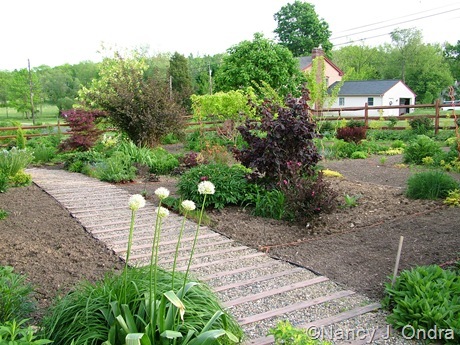 Congratulations on taking the big step of starting your garden-consulting business: Monarch Gardens! 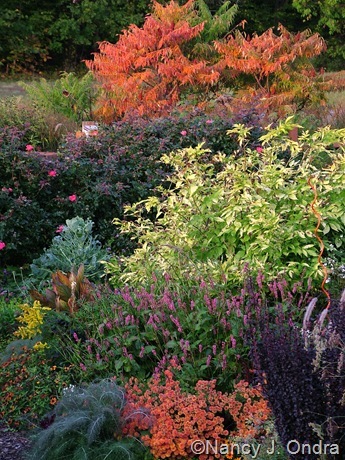 I strive to turn my front yard’s borders into something like your engaging swathes of color and texture… thanks to your posts I have been inspired! 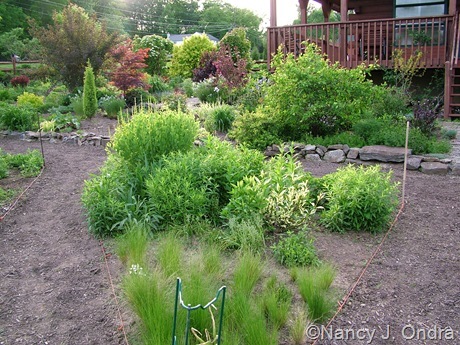 Recently purchased some seed for grasses that are hardy for my zone. 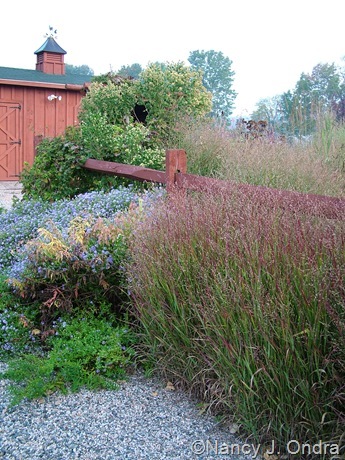 [Little Bluestem & Northern Sea Oats] I don’t use enough texture in my garden! Most of my plant placement is haphazard… But I need to relocate a Fernleaf Tansy that suddenly decided it wanted to be 4ft tall! It’s shading my Delphinium! Oh dear, Donna – a tansy shading a delphinium? That’s a switch! One grass that I’ve been starting a lot of seed of is prairie dropseed (Sporobolus heterolepis): it’s great for the front of a border, is tough as nails, has terrific fall color, and doesn’t see around too much (which is one drawback of the sea oats). I am in the process of expanding a far-too-narrow and crowded border, but seeing my properly spaced plants has left me feeling deflated. I know they will fill in, but I hate seeing mulch and am already making mental lists of plants to fill in the gaps. Considering the plant form/growth habit is intuitive common sense, but reading it and seeing it in your photographs is so helpful! Hey, Val. If you need some quick fillers (and your border is in at last part-day sun), think about zinnias: they come in a wide range of sizes and colors, and they grow quick enough that you could sow them now and have color this year. 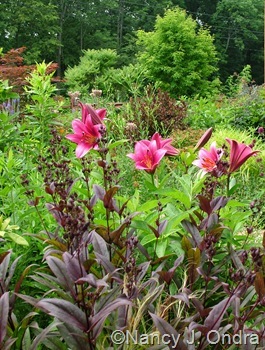 Sweet potato vines, love-in-a-mist, and nasturtiums can work great too. This is also a good time to start forget-me-nots to have fillers for next spring. Good luck! I, too, join the chorus to say this is by far my favorite post of yours. You generously share all your secrets, yet even with the grand reveal, I come away marveling not at how easy it really is, but at how insanely talented you are. Mostly as a brilliant plantsperson. Your experimental garden is just masterful. But also, of course, as a photographer. I am just more and more impressed the more I know. I’ve been gardening, teaching, and designing for a good bit. But YOU are my guru! I love the term “weavers” by the way for plants that don’t really take up any real estate. I’ll have to borrow that term. 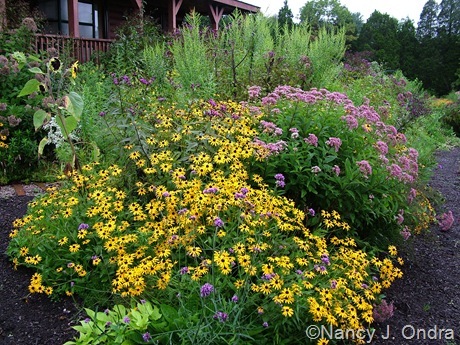 I never used to plant weavers (it’s hard to show them on a drawing), but they make such a big difference in elevating a perennial border. Thanks so much, Thomas. I can’t take credit for the term “weavers,” but I can’t remember where I first heard it ages ago, back when ‘Ann Folkard’ geranium was trendy and I was trying to figure out how it use it. aha! Now I get it! I am totally doing arches. thanks so much! Always delighted to inspire, Mimi. Good luck! I’m glad you found it useful, Kate: the bit of layering was for Teshia and the last part was for you. 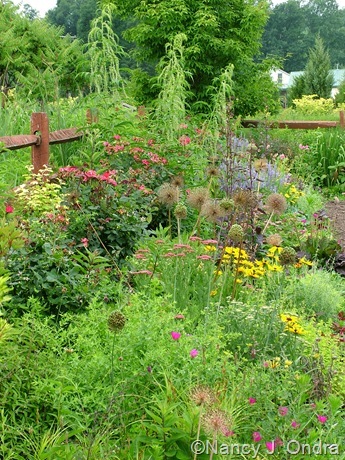 You know, using the narrow-beds-with-paths technique is a great way of garden-building, because you can create the layers over a period of years, as time and money allow. Good luck! Wonderful post! All excellent suggestions for making beautiful garden photos. I especially love the Kniphofia with the Rudebekias. And also the path through the meadow planting! (from the shot with the golden rod) That looks like a magical walk. Welcome, Julie! 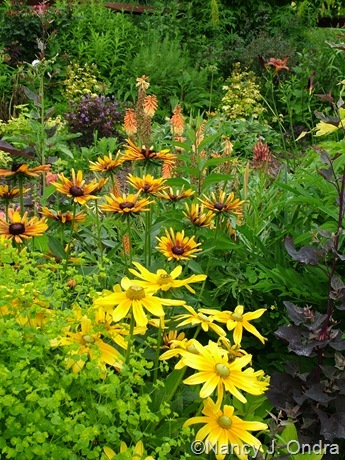 I liked the Kniphofia-and-Rudbeckia shot too. Isn’t it amazing how different it looks from a different angle? Thanks for visiting, Alan. Great name for your blog! i was beginning to wonder if i ran into another post, but amazingly you keep my interest the entire way! Very nice. exceptional post. One of my favorite reads online. I agree with you about moving plants around, which I do every year. lol. that’s when you know you are doing your gardening with passion and true artistic ‘flair’. It’s art! it’s exhilarating to a certain degree. I am amazed how accidental combination’s always seem to show up unexpectedly and are such a ‘gift’. Kudos. This post took on a life of its own…and it took a rather long time doing it. I should have split it into yet another part, but well, then the subject would have dragged on for yet another month. I’m happy you found it readable anyway. Yes, unplanned combinations are one of the best gifts a gardener can get. Wonderful story and photo examples. 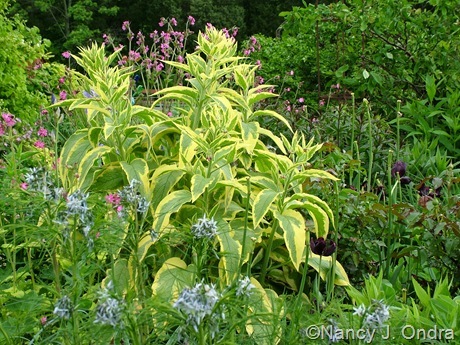 Your Perennial Care Manual is beside me right now as I just bought some goodies on sale, including rattlesnake master that I’ve coveted for years. Had to look up what you say about it. 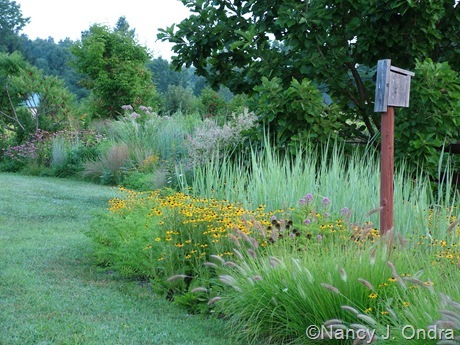 My husband has practically banded grasses from my garden as the seedlings of love grass in our gravel driveway drove him crazy! I have only a few varieties now and some sedges. 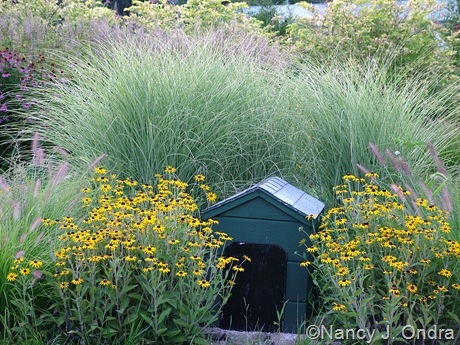 I do love what you do with them in so many of your vignettes — and your Grasses book is still one of my favorites. Thanks, Cameron. I’d be afraid to add love grass to the garden, seeing as it has already made itself quite at home in the meadow. I’d avoid purple top (Tridens flavus) for the same reason. Both are great in a meadow setting but can be too enthusiastic about self-sowing. I don’t find that to be a problem with most grasses, though. (In fact, sedges seem to seed around more readily than the grasses.) And gravel – well, that seems to be a fantastic propagation medium for just about anything. My own driveway is mostly a mix of crabgrass and Amsonia hubrichtii seedlings at the moment. I was really amused to read the planting spacing stuff. “All of sudden” (whatever THAT means), my garden went nuts and the planting is soooo dense that the weeds are struggling for air space. I lift ginormous leaves to discover missing perennials sprawling madly underneath. It’s craaaaazy! So I guess it just goes to show that even when you think you have it figured out, gardens are a living thing and need our constant loving attention. Thanks for all the advice–I need more room! And here, it’s been so dry that the plants are not filling out as they normally would, so there’s way too much space for weeds to come up. You just never know…. I must tell I’m a big fan of your blog as many others. Usually, I savor your post without leaving a comment (and I must confess that I’m also shy to do so). However, after reading this one I felt specially enthusiastic and in the obligation to toss away my timidity to make a compliment! Your passion for playing with plants is highly contagious and I like very much your unpretentious way to show us how to get the best of our gardens. Thank you very much for sharing your savoir-faire! You made my day, Jasmine. I too tend to be shy about commenting. It means a great deal, though, that the post really resonated with you and that you were inspired to leave a note. You must be a fellow plant geek! My gosh, I loved this post on so many levels. 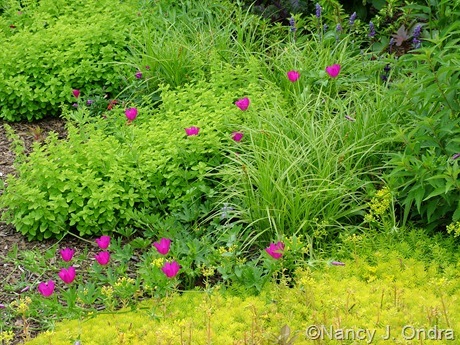 Like above, I appreciated all the photography tips on shooting to maximize the depth and fullness of the garden beds. But what I had no clue on was where you garden from. You are in Bucks county and I am from Berks county originally… neighbors. 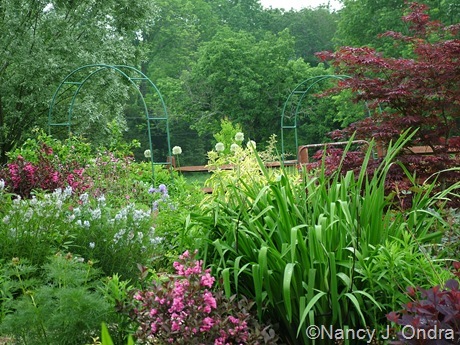 I often talk about and reminisce on my life in PA and how wonderful the gardens are there in comparison. I am going back to PA this summer for a visit and look forward to seeing all the lush mountainous landscapes I so greatly miss. Yep, I’m almost right at the junction of Bucks, Berks, Lehigh, and Montgomery counties. Sadly, it’s not looking at all lush here this summer, but Berks (and pretty much every other part of southeastern PA) has had much more rain than my parched little corner. Your garden shows no effect of the weather. Maybe that is your next post, ‘How to keep such a beautiful garden under parched conditions’. That or ‘how to shoot around the poor suffering plants’, like when the sun goes down. I maybe doing that here in the Falls. 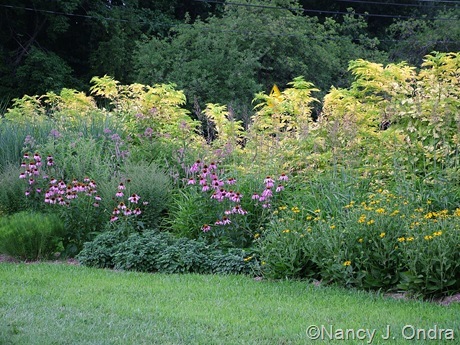 Light the landscape and take my photos when the plants get an evening reprieve and stand at attention for the night. I have pretty good luck shooting very early in the morning, once the plants have had a night to recover a bit. But my best advice is to take lots of pictures when things are in good shape, so you have plenty of archived images to use when the weather doesn’t cooperate. Thanks for making it through this mega-post, Toni. I’m happy that you found it worth it!